“Ha” in Sanskrit means solar energy and “tha” means lunar energy. Together, they gel to form “hatha” yoga, an amalgamation of two opposing forces. Hatha is the physical aspect of Ishta yoga which consists of various asanas or poses. But hatha yoga is not just any physical exercise, as there is a lot of importance given to breathing and pranayama yoga in it. These forms of controlled breathing exercises are a must after performing the asanas of hatha yoga. Hatha yoga is all about combining and bringing together all the opposing forces in your body- the masculine and the feminine, strength and flexibility, black and white etc. It is about building a strong physical and mental body, giving you control over your mind through breathing and control over your body through asanas. To achieve a greater spiritual level, you need to be able to combine all these opposing forces and be at peace with yourself. Tantra is an ancient Indian concept that says that, in order to find the divine in ourselves; we need to be separated from all the materialistic illusions (Maya) of the world. Tantra has been interpreted in many ways and the core of this practice lies in the belief that the divine is present in all of us but due to daily stressors, we cannot see it, or experience the power of the divine within. In ancient Indian texts, tantra was described as the union of two opposing forces- Shiva, the creator, strong and masculine and Shakti, the creative power, sublime and feminine. Each human has a Shiva and a Shakti present inside and more often than not, one part dominates over the other. Tantra helps bring about a balance of the two sides of our being, by freeing the other and creating a space where both are equal. Ayurveda comes from the Sanskrit words, “Ayur”, meaning life and “Veda”, meaning knowledge. Ayurveda is thus, the knowledge of life. This ancient science believes that human beings are constituted of the elements of the nature and in order to achieve physical well being, you need to understand your prakriti (constitution) and work with the elements of nature; not against them. Each pulse and action of the body signifies a greater deal happening inside. You can have a prepondence of pitta (hot) dosha with hot elements in abundance and be prone to many diseases because of your “dosha”. Ishta yoga takes your Ayurvedic “doshas” into account and creates a comprehensive study for making a customised Ayurveda plan, which includes lifestyle changes, for overall well being and health. An ISHTA class brings together asana to stretch, strengthen, balance, and release the physical body; pranayama with visualization to still and quiet the mind; and meditation to expand our awareness, with the goal of releasing energy and liberating consciousness. Human beings are becoming increasingly prone to stress, which is leading to a rise in the level of stress hormones. These hormones are similar to hormone secretions when an animal is under attack. They heighten the heart beat and create a level of alertness in the body often giving a faux sense of alertness and activeness which may continue for days. The body cannot distinguish between stress created from actual dangers like a physical attack and stress due to mental reasons and due to this, it needs proper relaxation. Ishta yoga rejuvenates the body and works on the nervous system and glands to reduce the release of these stress inducing hormones, bringing the body to a state of relaxed rest and peace. With various poses like the balasana (child’s pose), you prop up your muscles and bones and give them support as a result of which, your nervous system does not need to work to support the body. Your mind relaxes and the blood flow starts regulating and becomes slow. As you practice deep breathing and calm your internal body down, the heart pumps blood slowly and your whole body achieves a state of calmness. Yes, you can lose weight with Ishta yoga. One of the many benefits of Ishta yoga include weight and inch loss. But this is not the only thing you will achieve. You will gain muscle and be stronger, yet be as flexible as possible. With Ayurveda and the focus on knowing and understanding your inner composition, Ishta yoga helps prevent many diseases and serious ailments like infertility, cancer and skin problems. You will understand which element in your body is at odds with which element in nature, and take preventive measures to stop that influence. You also understand how to take care of your body and in turn, your body starts to take care of you. Although initially, this is a slow process, you will see its benefits in times to come. These are lifelong benefits that will not fade away. ISHTA yoga is one of the world´s most profund lineages of yoga, with integration of hatha, tantra and ayurveda to create the maximum benifit for the individual. To be able to show indiviuals to an understandning who they are, and how to be still and content in an ever changing world; both inside and outside. Also show that yoga is a science, not a religion. ISHTA stands for the Integrated Science of Hatha, Tantra, and Ayurveda; understanding more about these three key sciences of yoga will assist us in developing and sculpting the best yoga practice for each of us. Hatha relates to the physical body. In practising a sequence of asanas (postures) and pranayama (breathing techniques), we start to open the body’s channels so that energy can flow freely and we can begin to enjoy the feeling of bringing the body back into balance. Tantra comes from the root words tanoti (”expansion”) and trayati (”liberation”). In ISHTA, tantra refers to the oneness between the individual and the universe (often likened to a drop of water in the ocean), and the ability to expand and liberate the individual consciousness in order to connect to our inherent divinity. We practice tantra by using breathing and meditative techniques that expand our awareness of the more subtle aspects of being. Ayurveda is the science of life; specifically, what keeps us alive. Prana is the body’s life force and it is uniquely manifested in every individual. If we can understand how prana interacts with five key elements (air, space, fire, water, and earth), then we can begin to understand our body’s constitution. Knowing what makes us tick and, importantly, what doesn’t, is how ayurveda restores balance and ultimately brings us back to optimal health and well-being. The ISHTA Teacher Training programs provide a comprehensive foundation for all aspects of yoga: a uniquely modern, individualized, and integrated approach to this ancient science. Through in-depth asana practice, posture labs, practice teaching, anatomy, and lectures on a wide variety of topics, the ISHTA-trained practitioner is rendered fluent in all aspects of yoga. We provide exclusive and copyrighted manuals and are a Yoga Alliance-registered curriculum. Every ISHTA trainee has the opportunity to explore, learn, and teach, as well as enhance and enrich his or her own personal practice. ISHTA yoga was founded in the 1960s by Mani Finger and his son Alan. Their intention was to integrate all the different systems and teachings from two decades of study with famed yogis such as B.K.S Iyengar and Swami Nishraisananda and to bring yoga into the modern world. In Sweden, ISHTA Yoga Sadhaka (Masteryogi in training) yogini, Ulrica Norberg, is representing ISHTA yoga and its lineage. Kavi Yogi Swarananda Mani Finger and his son, Alan Finger, created ISHTA Yoga in the late 1960’s in South Africa. Mani was first initiated into Kriya Yoga by Paramhansa Yogananda in Los Angeles, and later as a Kavi yogi by Sivananda in India. 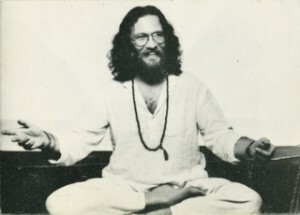 Mani subsequently went back to South Africa where he transformed his home into an ashram. 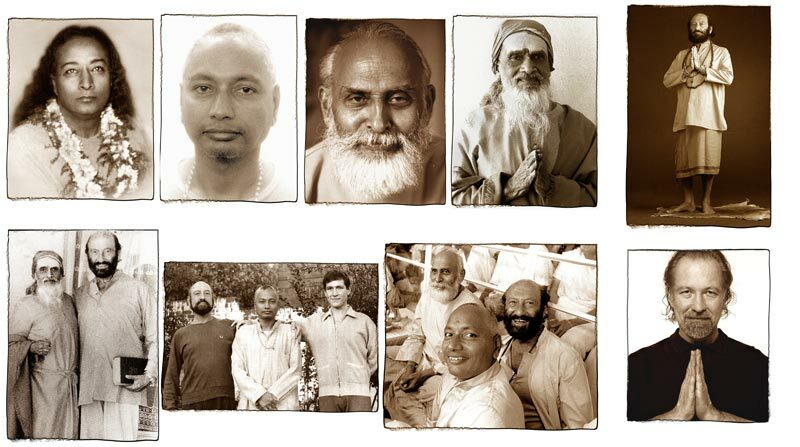 Over many years, Mani and Alan hosted many gurus at their house including Swami Venkatesananda (friend of T. Krishnamacharya and Sivananda’s ‘jewel student’), Ramakrishna Mission, Swami Nishraisananda, and Tantric master Shuddhand Bharati, who initiated both Alan and Mani into Tantra. Seeking to integrate and celebrate the different teachings and lineages that passed through their ashram, Mani and Alan created ISHTA Yoga. ISHTA aims to give each student an understanding of how to incorporate aspects from various yoga styles and practices in a way that best suits their individual paths. In 1975, after teaching in South Africa for thirteen years, Alan moved to the United States. He settled in Los Angeles and founded the Yoga Tantra Institute. Soon after, he co-founded Yoga Works. In 1993, Alan relocated to New York City and formed the Yoga Zone studios. Yoga Zone became Be Yoga and expanded Alan’s teachings into one of the most successful regional yoga teacher training programs in the country. Coming full circle, in 2004 Be Yoga rejoined the Yoga Works family of studios. As the culmination of his life-long development of ISHTA, Alan and his partners, Julie Wilcox, Sarah Platt, and Bruce Wilcox, opened the first ISHTA Yoga studio in Manhattan on May 1st, 2008, at 56 East 11th Street in Manhattan. For the first time, all elements of the ISHTA tradition had a dedicated home. In February 2011, ISHTA opened the doors to its uptown studio, located at 1026 Third Avenue in Manhattan. Paramahansa Yogananda: Author of Autobiography of a Yogi. Yogananda was Mani Finger’s introduction into yoga, his foremost teacher and his initiator into kriya yoga. Swami Venkatesananda: A friend of T. Krishnamacharya and a leading student of Sivananda’s. Venkatesananda wrote many books on yoga, and with co-author Kavi Yogiraj Mani Finger, wrote a book on Laya yoga. 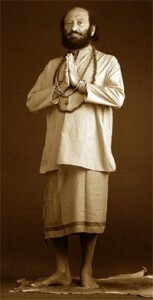 Venkatesananda, along with Mani, initiated Alan into Yogiraj. Venkates stayed with Mani and Alan for several weeks each year. Swami Nishraisananda: A scientist/engineer turned yogi and disciple of the Ramakrishna Mission. Nishraisananda’s understanding of the links between spiritual yogic concepts and modern science is the foundation of ISHTA’s conviction that we are only now beginning to understand in a ‘scientific’ perspective the physical and energetic effects of yoga, which ancient yogis intuitively understood thousands of years ago. Shuddhanand Bharati: A Tantric master. Bharati initiated both Alan and Mani into Tantra and was the driving force behind the systematization of ISHTA as a system of yoga.